In 2004 there were 22 officer-involved shootings, resulting in 10 civilians killed and 12 wounded. At least 2 were minors, and at least two were mentally ill. All of the officers were no-billed. 22. 12/10/04 - Doroteo L. Vasquez, h/m, 47, killed when shot once in the abdomen by off-duty Precinct 1 deputy constable Douglas Egbert, who followed Vasquez to his home after observing him driving erratically. Egbert told Vasquez to stay in his pickup, but he didn't understand because he spoke no English. As family members watched from the home, Vasquez approached Egbert with a knife, inflicting a minor cut on his arm, and Egbert shot him. Vasquez is the 10th person known to have been shot to death this year by a Harris County police officer. b/m, 19, shot to death by Houston PD officer Donaciano G. Moreno, 36 (an 11-year veteran), responding to a domestic violence call. Police claim Moreno shot Joseph several times after he pointed a pistol at Moreno. Joseph is the 9th person known to have been shot to death this year by a Harris County police officer. 20. 11/20/04 - Felix Manuel Aguirre, h/m, 22, wounded when shot by Houston PD officer R.A. Barajas (Central Patrol Div. ), who was responding to a shooting call. After Aguirre shot at a woman, he began talking a group of men on the street. Barajas claims Aguirre pointed a gun at his patrol car as he ran alongside it, and Barajas shot at him several times, hitting him in the arm. 19. 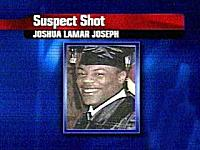 11/7/04 - Tomari Davis, unarmed, wounded when shot by Houston PD officer W. Hassan (Westside Patrol Div.) Davis attempted to kick in the door of an apartment, claiming to be God and yelling for "Nick." When Hassan arrived, Davis was in his pickup truck at the complex's exit gate, but quickly got out and allegedly ran toward Hassan. The officer ordered him to get on the ground, but claimed he refused and continued to run toward him. Hassan fired one shot, hitting Davis in the left leg below the knee. Davis' behavior would indicate he was either mentally ill, high on drugs, or both. h/m, 19 and unarmed, shot in the back and killed by Houston ISD police officer Richard McColister, 40, who said he found Rodriguez trying to pry open a vending machine on school property. Rodriguez had a screwdriver. Rodriguez is the 8th person known to have been shot to death this year by a Harris County police officer. 17. 10/15/04 - C.O. Middleton - wounded when shot by Harris County Sheriff's deputy R.H. Morrison. Middleton had been threatening neighbors with a gun. Morrison convinced him to put the gun down, but he then reached for it again. A struggle ensued, and Morrison claims his gun went off accidentally in the struggle. 16. 10/5/04 - LaDonna Banks, unarmed, wounded when shot in the head by Houston PD officer C. Pena Jr. Two persons walking to a bus stop became fearful they were about to be robbed when a car with two people in masks drove by them. Police were called and, as the two were being interviewed, the car came back around. Officers chased the car into a cul-de-sac, where the driver and the girl bailed out. The girl was soon found hiding under a car in a private driveway. Pena claims he ordered her to come out, she moved her hands, and he shot her. Officer Pena received no discipline and no training in gaining cover when dealing with suspects and his use of excessive force. 15. 10/4/04 - Shawna Felder, 35 and unarmed, shot in the back by Baytown PD officer D. Jones. Arrested on a domestic disturbance charge, Felder was threatening to harm herself in jail, and injured her foot. Taken to hospital, she escaped and stole an ambulance, but was caught after a 2- to 3-mile chase. Jones claims his gun accidentally discharged during a struggle. 12. 6/20/04 - James Lee Madden, b/m, 38, critically wounded when shot in the abdomen by Houston PD officer Hector Ramirez, 31, a 5-yr. veteran. Ramirez was off-duty at a car wash where he claims he saw a pistol in Madden’s waistband and saw him make "some type of suspicious gesture." So he shot him. 11. 6/19/04 - Maurice Baldwin Canty, b/m, 39, critically wounded when shot by off-duty Houston PD officer Dong Q. Hoang, a/m, 27 (2-yr. veteran, Westside Patrol Div. ), who was questioning Canty after arresting him for shoplifting. Canty, although handcuffed behind his back, pulled a pistol from his side and shot Hoang in the left arm and hand. Hoang returned fire, striking Canty several times. 9. 5/19/04 - M. Benavidez, h/m, unarmed, wounded when shot by Harris County sheriff's deputy W. Thomas as he and another man burglarized a stereo shop. He was Life-Flighted to a hospital. 05/08/04 - Robert E. Barkley, 36, shot in the face and hand by Wilkinson, working off-duty as a security guard for Dillard’s. 06/01/94 - Darryl Robinson is killed by off-duty sheriff's deputies working at Dillard's. 6. 4/29/04 Humero Becerra - h/m, unarmed teen, wounded when shot in the shoulder by Harris County sheriff's deputy R. Vandine, who said the van Becerra was driving was stolen. When he told Becerra to raise his hands, Vandine claims Becerra instead began to reach under the seat, so he shot him. There was no weapon in the van. 5. 3/26/04 - Dwayne Anthony Meyers, 41, shot once in the abdomen and killed by Harris County sheriff's deputy J. Jackson. Police claim Meyers ran toward them with a screwdriver when they entered his motel room and tried to pull a woman out of the room. He was wanted on a drug possession charge. Meyers is the 4th person known to have been shot to death this year by a Harris County police officer. See also: 1/11/97 - Zachary Long shoots Gene Allen Blackwell. 3. 1/26/04 - Tairon Anthony Gray, 23 and mentally ill, shot to death by Precinct 1 deputy constables Andy Reyna Jr., 33, and Chris Jaris, 35 (Mental Health Unit), who were attempting to take him to a psychiatric center. Claiming Gray pulled a butcher knife when he saw them, the deputies tackled him and fired 10 or 11 shots during the ensuing struggle. Gray is the 2nd person known to have been shot to death this year by a Harris County police officer. 2. 1/19/04 - Derrick Jerome Baines, 23, shot in the head and chest and killed by Houston PD officer G.B. Stinson, 34, w/m, a 6-year veteran from the Westside Division. Police say he had robbed a convenience store and was being chased on foot by an officer. The fleeing man was knocked to the ground by Stinson's patrol car. Stinson claims the man drew a gun, manipulated the slide and pointed it at him. And so Stinson shot him. Baines is the 1st person known to have been shot to death this year by a Harris County police officer. 1. 1/8/04 – Roberto Aleman Ojeda, h/m, 52, wounded when shot in the leg by Houston PD officer James P. Tyler. The homeless Ojeda had set up a camp blocking a sidewalk and allegedly swung a club when Tyler approached him.